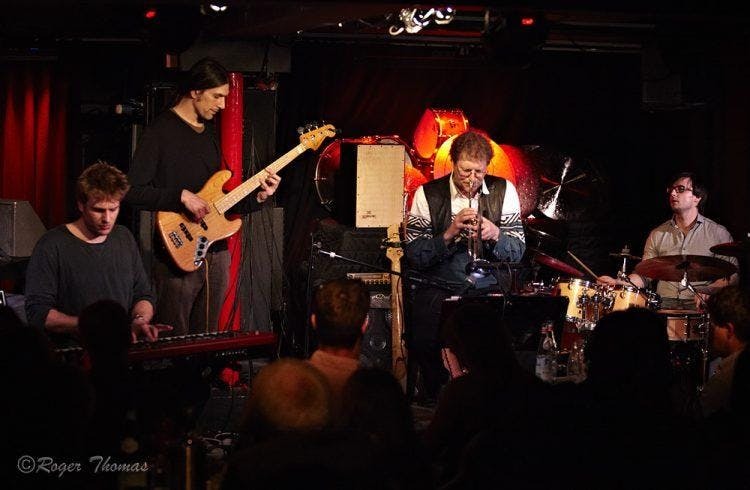 NIM QUARTET’ is the project of London based bass player Nim Sadot who conjures up a magical mix of instrumental fusion jazz. His debut album 'NIM QUARTET’ has been mixed and mastered by Nick Taylor at the 'Air Edel' Studios in London..
Nim has played with some of the top names in the jazz world including Harvey Mason (USA), Marlene (Japan,CBS,SONY), Snow Boy (UK), Makoto Kuriya (Japan) and Tony Lakatos (Hungary). "Nim Quartet' consists of a heady cocktail of international musicians making its mix of cultures one of the quartet’s many strengths. In the studio they have developed a sensational variety of sounds that easily translate into their pulsating live performances – creating fascination for the listener via an extraordinary density of sound, catchy melodies, and the culture of their musicianship. 'Nim Quartet' present fusion jazz in a dynamic new light!"